A family-owned and operated company founded in northern Minnesota in 1942, Mack began as a welding company to support the forestry and mining industries, but quickly reinvented itself as a crane attachment manufacturer specializing in material handling. 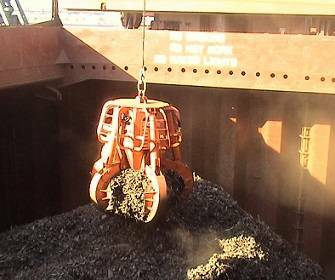 Today, this focus is highlighted by Mack’s expanding range of clamshell buckets and grabs for the stevedoring industry, particularly well serviced from the company’s current base on Alabama’s Gulf Coast. Of Mack’s approximate annual sales of $7+ million, roughly 15 percent can be attributed to direct exports. “The 25-yard buckets used to be the largest size we ever produced for these applications,” said Matt Davidson, Vice President of Sales and Marketing, “but we’ll build them as big as our customers need. We have been receiving orders recently for ship-mounted cranes rated up to as much as 30 and 35 tons.” The company recently commissioned a 40-cubic-yard bucket, painted in the crimson red of the NCAA National Champion University of Alabama Football Team. 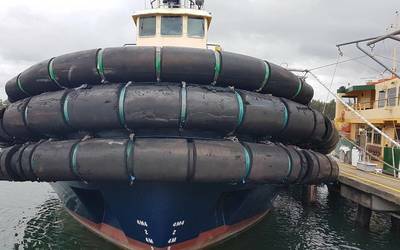 Whereas smaller “touch and go” buckets were once more common in use with ship cranes, Mack has found most shipbuilders and stevedoring firms today wish to adopt the company’s single-line buckets. 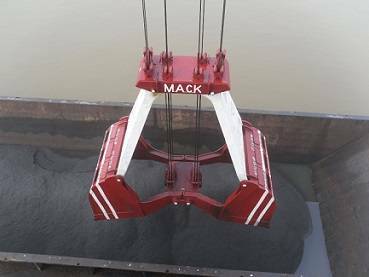 Gaining in particular popularity is Mack’s self-contained, diesel-powered grapples and buckets with remote controls, an innovative market introduction which allows customers to handle materials with higher densities such as pig iron and HBI. “However, they still offer the simplicity and versatility you want on a ship’s crane, compared to the electrically-powered units used by port facilities,” Davidson said. Radio-controlled models allow operators to actuate the bucket hydraulics from onboard the ship or from the dock, anywhere within a 500-foot radius of the crane. The solenoid control valve on the bucket is powered by a 12V marine battery. Standard models include a second valve which can be attached to a ¼-inch line as a backup to the radio control. Mack also has a full range of medium-duty buckets recommended for off-loading bulk materials up to 100 pounds per cubic foot, as well as light-duty buckets offering weight savings and lower costs for moving grains and similar materials under 60 pounds per cubic foot.